Quand les hommes sont morts, ils entrent dans l’histoire. Quand les statues sont mortes, elles entrent dans l’art. Cette botanique de la mort, c’est ce que nous appelons la culture. This 30 minute short film has a chequered history of censorship that at one time elevated it to a somewhat mythical status, and which prevented it from being brought into the wider public eye until some 16 years after it was completed. 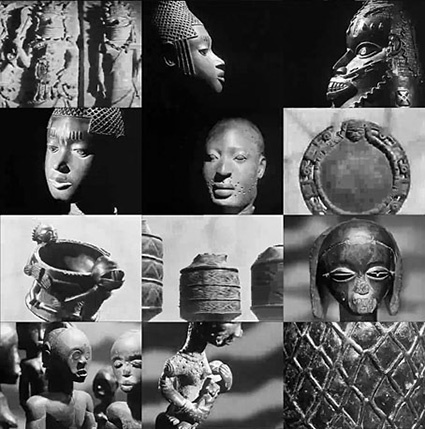 After its first screening at the Cannes Film Festival in 1953, and in spite of winning the Prix Jean Vigo in 1954, Les Statues meurent aussi was banned in France by the Centre National de la Cinématographie between 1953 and 1963 owing to its controversial anti-colonialist stance. While a truncated version was made available in 1963, the unabridged film only became available in 1968. If anyone can help identify the others that appear here, please do so in the comments section. I would also welcome reflections on what Alain Resnais means to you personally. 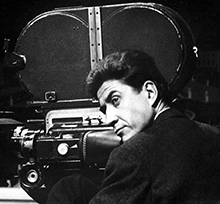 It is hard yet to speak of Resnais, like Marker a true genius of cinema, but completely unique. 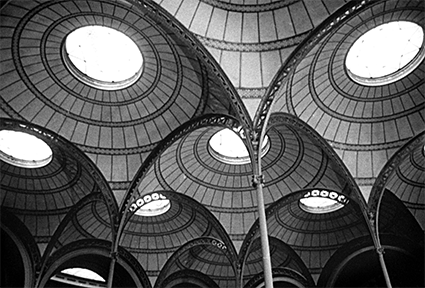 Both were fascinated by memory; Resnais’ best films are enigmas of memory and time. It occurs to me that there was, in the making of Les Statues meurent aussi, some discovery made à deux that was to follow both filmmakers throughout their careers, whatever the genre. Resnais, like Marker, created films that asked the spectator to view them not once or even twice, but many times – as if the films were changing, mutating between viewings – and changing the viewer each time as well. Toute la mémoire du monde, Hiroshima mon amour, Nuit et brouillard, Muriel and the incomparable Last Year in Marienbad come to mind for me, for I have viewed them many times. I’ll remember Alain Resnais mainly for Mon oncle d’Amérique, a movie from 1980, which pictures the ideas (theories) of Henri Laborit, a surgeon and also a essayist. A pertinent view of sociological influences on some diseases, and an interesting global view of (human) being. ”a celebration combined with a game of cards” ; It’s was the poll vote actually. Thank you Jahmorinz – in retrospect, it seems obvious, and I feel that I was a bit lazy in my viewing of the clip. In any case, thanks for the clarification.